When Mozzeria, a hideaway-style restaurant on 16th Street in San Francisco's Mission District, opened its doors on December 9, 2011, it was the culmination of a lifelong dream for Melody Stein. After a nearly decade-long stint working at Communication Service for the Deaf (CSD) in Sioux Falls, South Dakota, Melody and Russ returned to San Francisco. 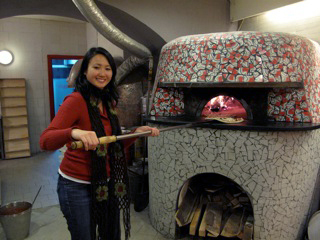 After trying Neapolitan-style pizza (and "falling in love" with it, she learned the art of making them, from scratch, in Italy. Neapolitan-style pizzas are cooked quickly in wood-fired brick ovens (90 seconds at 12,000º), which gives them a blistered, even charred, texture and a distinctively smoky taste. Stein ordered a wood-burning oven from Naples—the focal point of the sleek little eatery. Next came the ordeal of securing funding for her new venture. Restaurants are considered "the worst business risk for investment," even for hearing entrepreneurs. In San Francisco, a city with a sophisticated culinary culture, the competition is fierce. Stein had to cope with additional frustrations, such as the various City inspectors who arrived without the sign-language interpreters she'd requested. She's kept an iPad handy for multiple-person meetings, and also uses a UbiDuo. On December 9, 2011, Mozzeria opened for dinner. There was a large, enthusiastic crowd (although the space is relatively small). Despite glitches such as neighborhood power outages, business has been hot. (Russ dashed out to buy candles for the tables, and the menu was curtailed . . . and, of course, pizza was available. Customers still came in.) Mozzeria has already hosted several private gatherings, such as Gallaudet alumni and a wedding reception. Deaf and hearing diners, signers and nonsigners, are equally welcome. They use VRS for takeout orders. Their serving staff are all fluent in ASL; three are Deaf. Two dishwashers are Deaf; the third knows ASL. The Steins' goal is to have a restaurant known for its excellent Italian food. Most of the reviews have been good, as word has gotten around. During dinner, the 45-seater space gets filled quickly (so while walk-ins are welcome, reservations are recommended). Many patrons have sampled the menu and returned, so there's a cadre of regulars. Stein calls her experience a "journey" and an "adventure." It's one that's just starting to unfold.